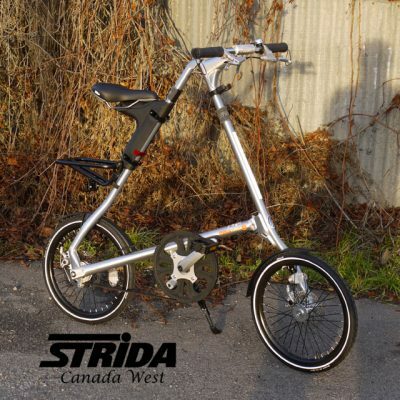 When I think of a classic Strida I always picture a Strida with a brushed aluminum frame. 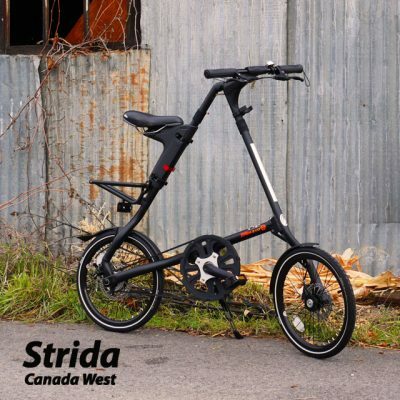 This custom Strida Brushed Aluminum EVO has been upgraded to feature a Strida Black Alloy beltwheel and black crank arms. 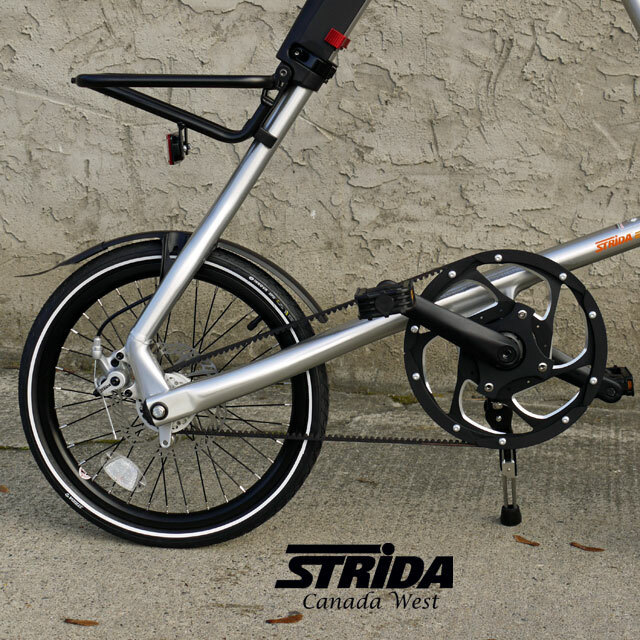 The Alloy beltwheel looks terrific with the brushed aluminum Strida frame and it is much stiffer. 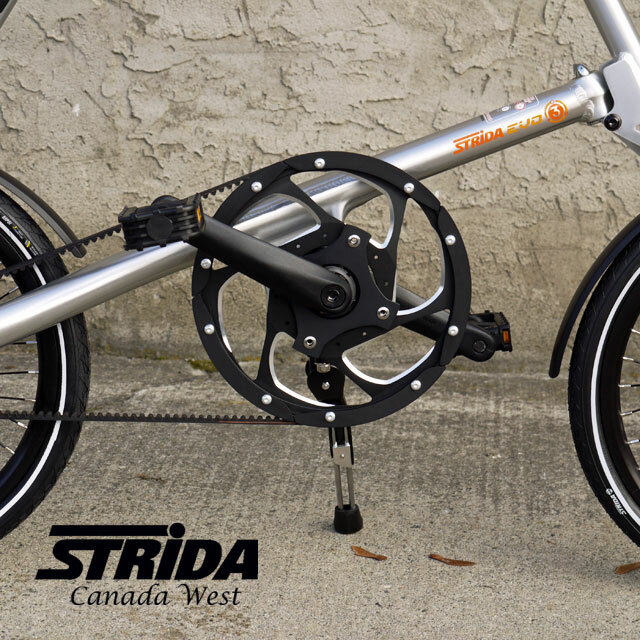 The stiffer Strida alloy beltwheel is noticeable when pedaling hard. 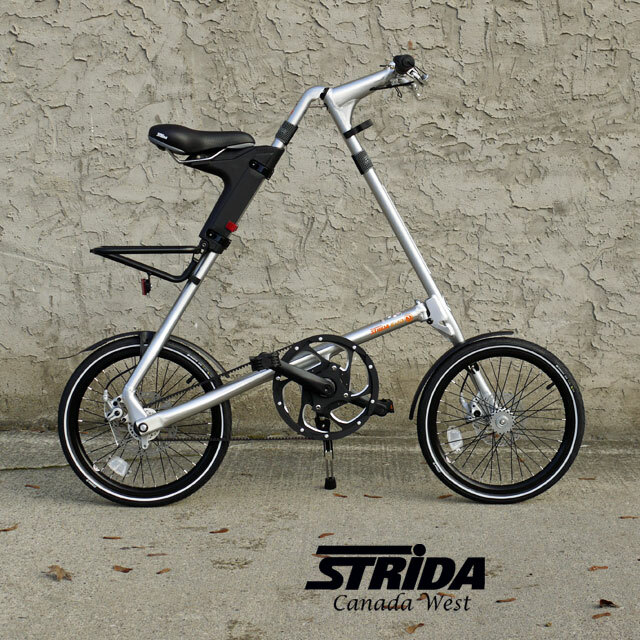 The alloy beltwheel does not bend as much as the standard Strida beltwheel. 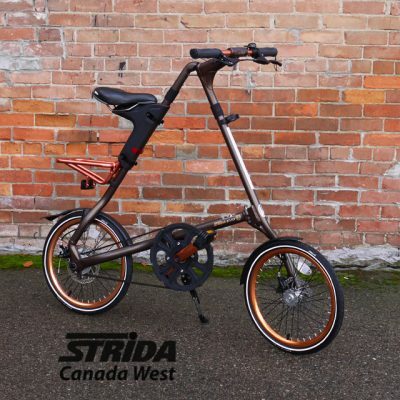 This may not be for everyone, the alloy beltwheel can bend if impacted where the nylon beltwheel will absorb more impact. But the alloy beltwheel does look very good. For daily use I prefer the stiffer alloy beltwheel. 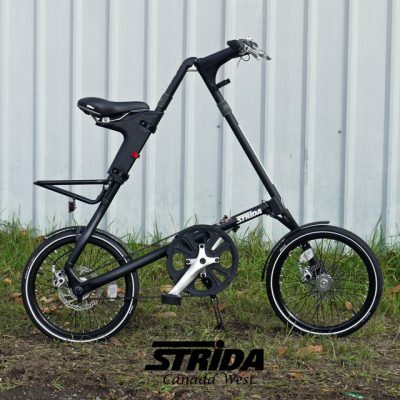 If I was going to load my Strida in a bag and fly with it then I would prefer the standard nylon beltwheel. But why stop with a black alloy beltwheel? There are many more ways this Brushed Aluminum EVO could be further customized. 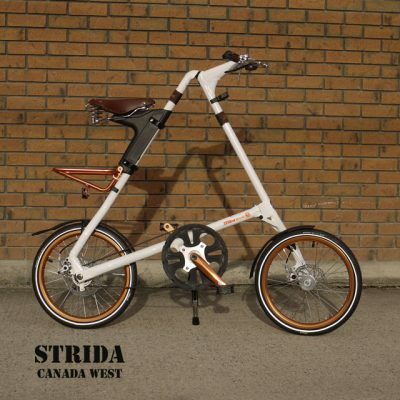 I would consider adding black alloy pedals, a black pannier rack, a black leather saddle and black leather ergo grips. 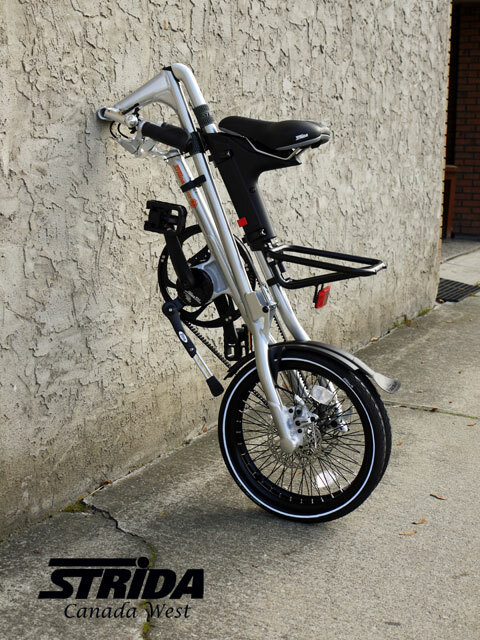 Here is a list of upgrades and the costs for you to consider if you would like to build your own custom Strida Brushed Aluminum EVO. In some cases the cost is discounted from the regular cost. I will install the upgrades before shipping and retain the original parts. 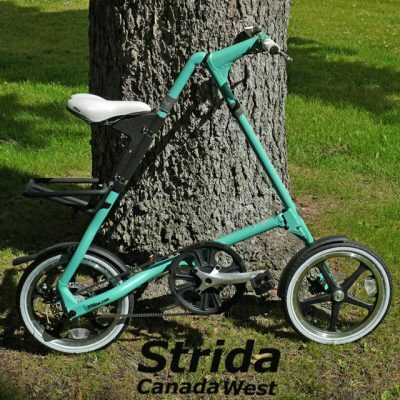 This Strida has 18 inch wheels. It is possible for me to install 16 inch black wheels if you prefer the small wheels. 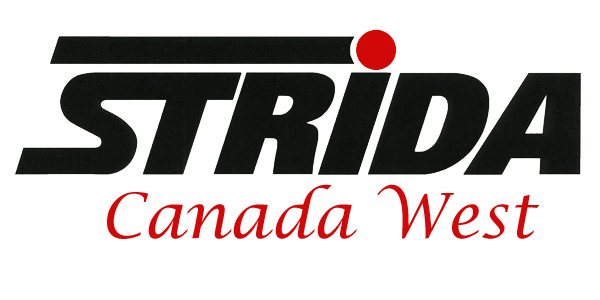 Please contact me before ordering so that I can adjust the cost.